The Incredible Mighty Mini Pick-Up! Instead of irritating clamps and distorted sound, this amazing amplification device threads lightly under and over the strings below the bridge, and plugs into an amp to produce the clear natural sound of your instrument, no matter how loud the volume. It fits all string instruments including guitar! 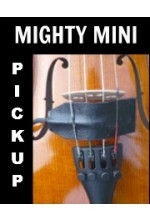 Mighty Mini Pick-Up for Violin, Viola & Cello #11001 An absolute necessity for any strin.. Mighty Mini Pick-Up - Set of 2 - Save! Mighty Mini Pick-Up - Package of 2 An absolute necessity for any string player! #11000-Set ~ONLINE..